Click Add to get list of available tags. Enter the name of a tag to search for it. Click a tag to add it. 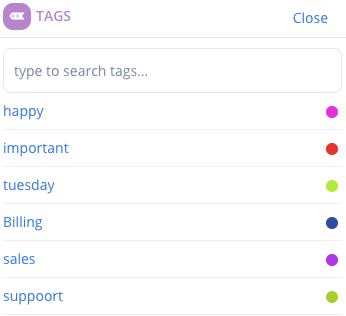 You can use the TAGS tab to go to a tag in the list and use enter to select it. It is also possible to add multiple tags to a conversation. To remove a tag from a conversation, click on x next to the tag. Note that only Dixa administrators can add and remove the available tags.